ArchTec Series 50 Gallon Parkview Multi Compartment Recycling Bin by ArchTec at In The National Interest. MPN: 72720199. Hurry! Limited time offer. Offer valid only while supplies last. 72720199 Features: -Black color. -Weather resistant. -Removable liner. -Multi purpose recycling type. -ADA compliant. Product Type: -Recycling bin. 72720199 Features: -Black color. -Weather resistant. -Removable liner. -Multi purpose recycling type. -ADA compliant. Product Type: -Recycling bin. Gallon Capacity: -50 Gallons. Color: -Black. Rain Protector: -Yes. Shape: -Rectangular. Application: -Indoor/Outdoor. Recycling Type: -Multi-Purpose. Multi-Compartment: -Yes. Room Use: -Garage. Primary Material: -Steel. Lid Included: -Yes. Liner Included: -Yes. Trash Bag Fastener: -Yes. 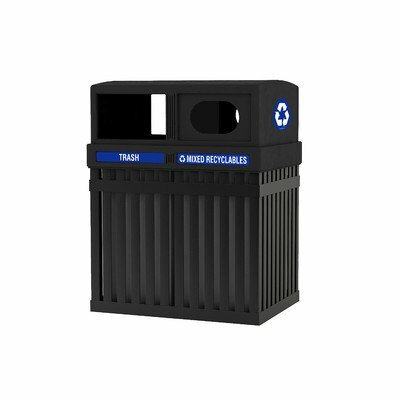 Residential Recycling Application: -Yes. Lid Type: -Dome. Removable Liner: -Yes. Dimensions: Overall Height - Top to Bottom: -39.5". Overall Width - Side to Side: -29.75". Overall Depth - Front to Back: -21.75". Overall Product Weight: -100 lbs. If you have any questions about this product by ArchTec, contact us by completing and submitting the form below. If you are looking for a specif part number, please include it with your message.